Not every previous Fraser post is about my personal ancestors. And neither is most of this one. As background, my buddy Lizzie and I have a common ancestor, one Duncan Fraser (c1783-1867), a blacksmith in Killin, Perthshire. Three of Duncan’s sons were William Fraser, MD (1810-1872), my ancestor John Fraser (1808-????) and her ancestor Donald Fraser (1819-1880). We have a theory that two other sons may have followed their older brothers to Canada. Another mystery is the identity of a Fraser witness at the 19 June 1800 marriage in Montreal of John Charles and Lucille LeBrun (Fraser blog 30 April 2008). Their daughter Miranda Charles later married Dr. William Fraser in 1840. But who was the Fraser in Montreal in 1800? The signature is very difficult to read, with the first name abbreviated. It begins with Eli ..., seeming to be Elisth. Certainly there were plenty of Scots in Montreal at the time, in the fur trade and other mercantile ventures. Hence a few reasons for browsing the Drouin collection on Ancestry.ca looking for Fraser marriages (knowing full well that, at present, the database is incomplete for Protestant registers in Quebec). This session did not produce likely-looking results for me, but I did stumble across an intriguing tangent. At Notre Dame Basilica in Quebec City on 24 October 1842, John Fraser Esq. [Ecuyer], notary of Terrebonne parish, married Dlle. [Demoiselle] Elizabeth Fraser of Quebec parish. (1) Some will get a chuckle that the groom’s surname was indexed in the database as Ecuyer and the bride as Della Elizabeth. I hear moans about outsourcing the indexing. Someone looking for this John Fraser would have a hard time finding him! It’s unclear whether each relationship applies to the bride or groom. Moreover, the Bishop of Quebec gave two dispensations for (a) the publishing of banns and (b) second degree of consanguinity—the latter commonly indicating the parties are first cousins (having mutual grandparents) or perhaps uncle and niece. Such a rich Fraser cornucopia deserved at least a cursory Internet search. Since the two Honourables looked promising, I first looked at the website of the Quebec National Assembly (NAQ) www.assnat.qc.ca/eng/index.html, which has a list of all elected representatives over the years. Hon. John Malcolm Fraser (c1800-1860) was born at Malbaie, son of Malcolm Fraser and his mistress Marguerite Ducros dit Laterreur. John Malcolm inherited part of his father’s Mount Murray estate in 1815 and became a leading figure in Quebec City commerce and politics. In 1827 he married Grace Forsyth, daughter of another Quebec merchant, Henry George Forsyth, originally from Aberdeen, Scotland, in Quebec City’s Holy Trinity Anglican Cathedral. Names of their children are not mentioned, but clearly they would have some Forsyth cousins. The NAQ site also had an entry for Hon. John Fraser de Berry. Born at Laval 25 November 1816, he was the son of Simon Fraser (a doctor with the 42nd Regiment of Royal Highlanders or Black Watch); died 15 November 1876. John “Fraser de Berry’s” brief bio includes his early studies at Terrebonne and Montreal, with admission to the practice of notary in 1839. He was also prominent in various provincial and other appointments. In the mid-1860s he assumed the de Berry name of his Norman ancestors. He married his cousin Elizabeth Fraser in Notre-Dame-de-Québec parish on 24 October 1842. Aha. This must be our groom. Next I searched Dictionary of Canadian Biography (DCB) http://www.biographi.ca/. The only relevant Fraser seemed to be a Malcom Fraser (1733-1815) who had a son John Malcom (with no entry in DCB). According to the DCB historian, Malcolm was born in Abernethy, Perthshire, Scotland. After Malcolm’s service in Nova Scotia and Quebec with the 78th Foot regiment (Fraser Highlanders), he retired as a lieutenant and acquired the seigneury of Mount-Murray, Quebec, within the former Malbaie seigneury. In his lifetime he became a large landowner in several areas of Quebec. Of numerous children by two women, three of the sons are named as Simon, Joseph and John Malcolm. The latter looks like the same man who married Grace Forsyth. Was I getting somewhere? Not leaving well enough alone, I found a delicious potpourri of John Fraser de Berry information on the Clan Fraser Society of Canada website http://www.clanfraser.ca/fraserde.htm. The editor of the piece declares, “John Fraser de Berry spent a lifetime inventing and reinventing his ancestry and genealogy, as evidenced by the following examples from published sources in Quebec.” Then ensues an editorial dissection of various descriptions written by or about the man—autobiographical accounts and obituaries. One of his greatest goals was to revive and head the “New Clan Fraser,” considering all the former Fraser Highlanders who had settled in Quebec. Fraser de Berry was well known for claiming descent from Lord Lovat (Simon Fraser the Jacobite) and being the 58th descendant of Jules de Berry who lived in France in the eighth century AD. The clan foundational meeting in 1868 and the chief’s impressive lineage prompted a number of humourous letters to The Quebec Morning Chronicle. Separating what appear to be facts from the hogwash, we find that neither John’s father (Simon, 1768-1844) nor grandfather (Malcom, 1733-1815) had any descent at all from Lord Lovat, whose direct line ended with his own execution in 1747. Fraser de Berry adroitly concealed two generations of illegitimacy in his true pedigree. Historians have discounted the de Berry encounter with Charlemagne's court as fable. Nevertheless, Fraser de Berry was Seigneur of Contrecoeur and Cournoyer, a longtime convert to Catholicism, fluently bilingual and counsel for the Quebec Legislative Assembly when he died. His vision of the clan model laid the foundation for the Clan Fraser Society of Canada. One tangent leads to another. This is what happens to genealogists. It began as a lazy-day exercise and look where it took me. Have I almost forgotten de Berry’s wife Elizabeth Fraser? Elizabeth’s obituary in 1901, quoted on the Clan Fraser website, mentions only a brother William. It seems mutual grandfather Malcolm had five sons: Alexander, Joseph, Simon, William and John Malcolm (no attempt at birth order here). The bride Elizabeth may be the daughter of Alexander, who purportedly had an Elizabeth, William and Madeleine among his children. Thus the Hon. John Malcolm Fraser was the paternal uncle of both bride and groom while the second uncle John is still a puzzle. It will take far more than Internet browsing to untangle and reconstruct these families. If what we see so far is even trustworthy! (1) Fraser-Fraser marriage, 1842, Notre Dame Basilica register, Quebec City, no. 151, p. 204, “Drouin Collection,” digital image, Ancestry.ca (www.ancestry.ca : accessed 1 April 2009). The busy season is here. Spring genealogy seminars and conferences have already begun. Planning for them never ends. Everyone I know is doing three or four jobs. Meetings, tasks, thinking, details, memos, reminders, copious amounts of paper being generated, tons of emails and even worse, phone calls. I needed a camel photograph to calm me down. And keep in touch with my blog. What a handsome fellow. See you? at the annual Ontario Genealogical Society Conference 29-31 May at Sheridan College in Oakville. 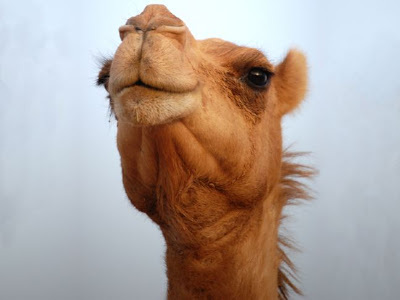 Neil Carey, photographer, fohn.net, “Camel Pictures and Interesting Facts,” (http://fohn.net/camel-pictures-facts/#arabian).